After more than a year spent dancing into our hearts and gardens, objections from the King of Pop's estate cause PopCap Games to replace the killer Michael Jackson lookalike in Plants Vs. Zombies. The Dancing Zombie in Plants Vs. Zombies will forever remain the Michael Jackson Zombie in my heart, even if plans are currently underway to replace him in all versions of the game with a disco-themed imposter. MTV Multiplayer's Russ Frushtick reached out to PopCap to ask about the change, learning that Michael Jackson's estate had contacted the publisher with objections. 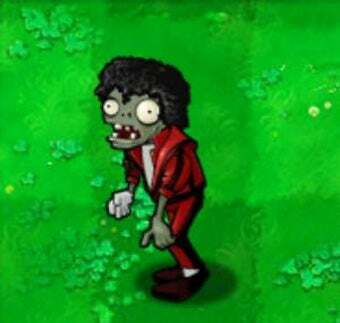 "The Estate of Michael Jackson objected to our use of the 'dancing zombie' in PLANTS vs. ZOMBIES based on its view that the zombie too closely resembled Michael Jackson. After receiving this objection, PopCap made a business decision to retire the original 'dancing zombie' and replace it with a different 'dancing zombie' character for future builds of PLANTS vs. ZOMBIES on all platforms. The phase-out and replacement process is underway." The change has already been implemented in the iPhone version of the game with the latest update, with plans to phase out the dead pop singer across all platforms.